If your locked out or have a broken Chubb Lock. Call JP Locksmiths, We are trained in non-destructive entry, and we can gain access to your locked property. 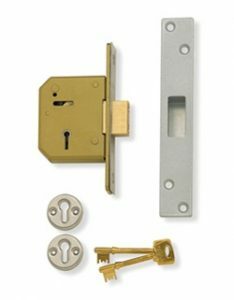 This a picture of a 5 lever Mortice DeadLock, commonly referred to as a Chubb Lock. Chubb started as a ship’s ironmonger by Charles Chubb in Winchester, England and then moved to Portsmouth, England in 1804. Chubb moved the company into the locksmith business in 1818 in Wolverhampton. The company worked out of a number of premises in Wolverhampton including the purpose built factory on Railway Street now still known as the Chubb Building. His brother Jeremiah Chubb then joined the company and they sold Jeremiah’s patented detector lock. In 1823, the company was awarded a special licence by George IV and later became the sole supplier of locks to the General Post Office and a supplier to Her Majesty’s Prison Service. In 1835, they received a patent for a burglar-resisting safe and opened a safe factory in London in 1837. In 1851, they designed a special secure display case for the Koh-i-Noor diamond for its appearance at The Great Exhibition. In 1984, the company was purchased by Racal under the chairmanship of Sir Ernest Harrison OBE. After the group was floated out from Racal, in 1997 it was bought by Williams plc. In August 2000, they were sold to Assa Abloy. In 2006, Chubb was merged into the Mul-T-Lock group within Assa Abloy. The Chubb Electronic Security subsidiaries produce smoke detectors, fire alarms, Burglar alarms and glass break detectors. Sherlock Holmes says in the Arthur Conan Doyle short story “A Scandal in Bohemia” that Irene Adler has a Chubb lock on her London villa’s door.